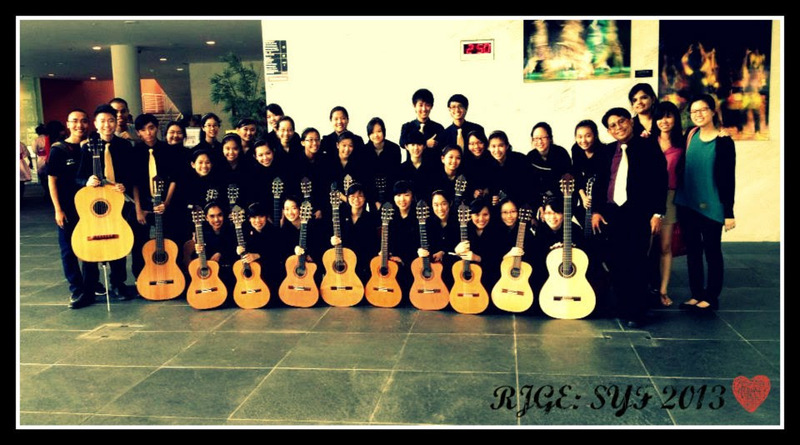 The Raffles Institution (Year 5-6) Guitar Ensemble (RJGE) has risen to prominence to be one of the best full-fledged Niibori guitar ensembles in Singapore at the JC level under the baton of Mr. Michael Gaspar. RJGE took part in the biennial Singapore Youth Festival (SYF) in 2013, where we performed two beautiful classical pieces, “Mountains in Autumn” and “Slavonic Dance No. 8”. It was a great opportunity for us to bond and get together to make music as a family and our efforts culminated into a hard-earned Distinction. 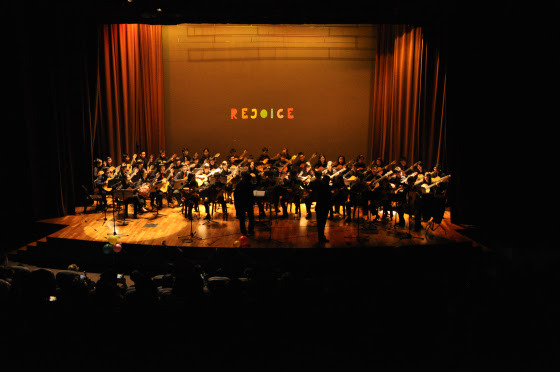 Also, a combined concert with the RI (Year 1-4) Guitar Ensemble, REJOICE! was put up in May. This concert was the highlight of our RJGE year as we worked together to put up an amazing concert featuring various genres of music and creative works arranged by our own members. With supportive instructors and teachers, our ensemble is given the freedom to experiment, explore and enjoy. We put together a wide repertoire, ranging from classical and folk pieces, to more modern pieces featuring Jay Chou songs, a movie medley and even Disney cartoon theme songs. It was definitely a night to behold for the whole ensemble when we showcased our musical talent, exhibited great teamwork and enjoyed good fun. Next year, there will be several exciting performances and competition to look forward to, including the 8th Guitar Ensemble Festival in April as well as our very own concert in May. All Year 5 students are welcome to join the RJGE family to play good music and forge new friendships! No prior guitar background is required to join as lessons will be conducted by your seniors. We encourage all Y5s to join us for auditions and begin your journey with RJGE!